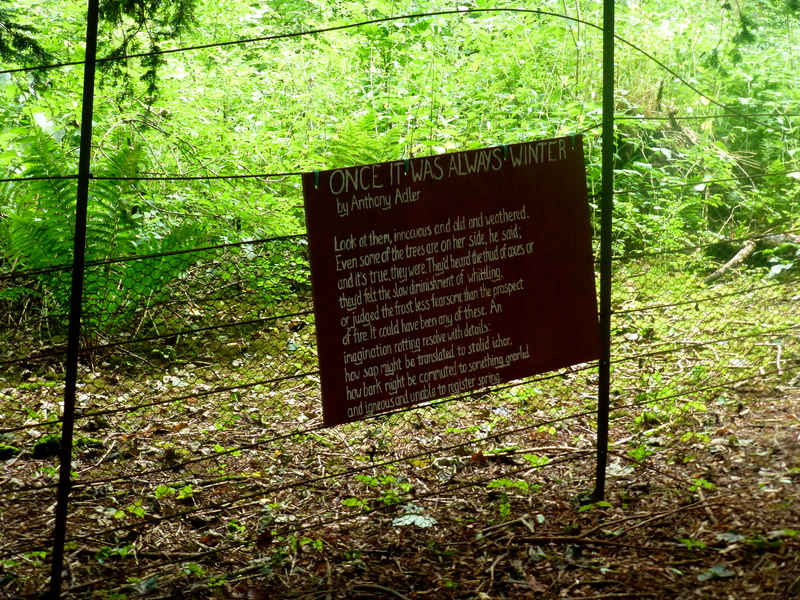 Beneath the Boughs was a poetry installation exhibited at Lowther Castle and Gardens, near Penrith, over the summer of 2013. 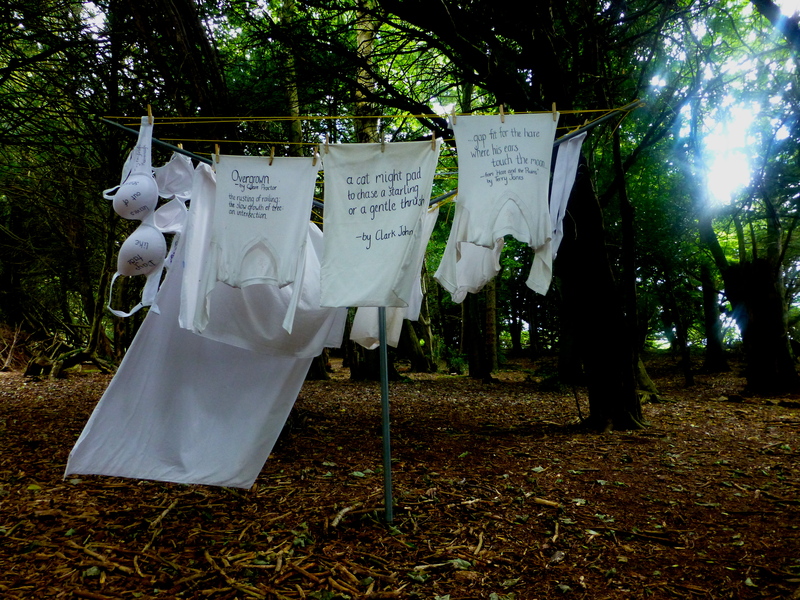 It was arranged by guerilla poetry collective [insert text here]. 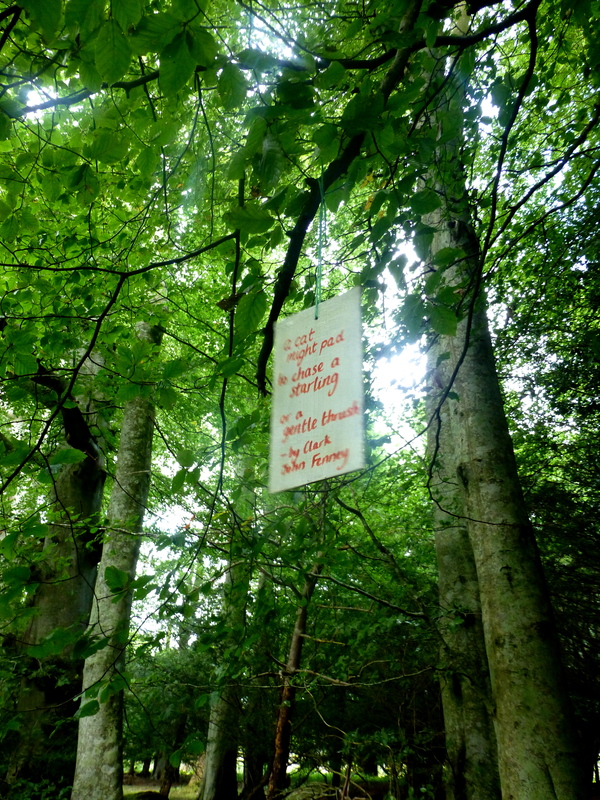 My poem ‘Redwoods’ was included and appeared in several places around the grounds, in various formations. 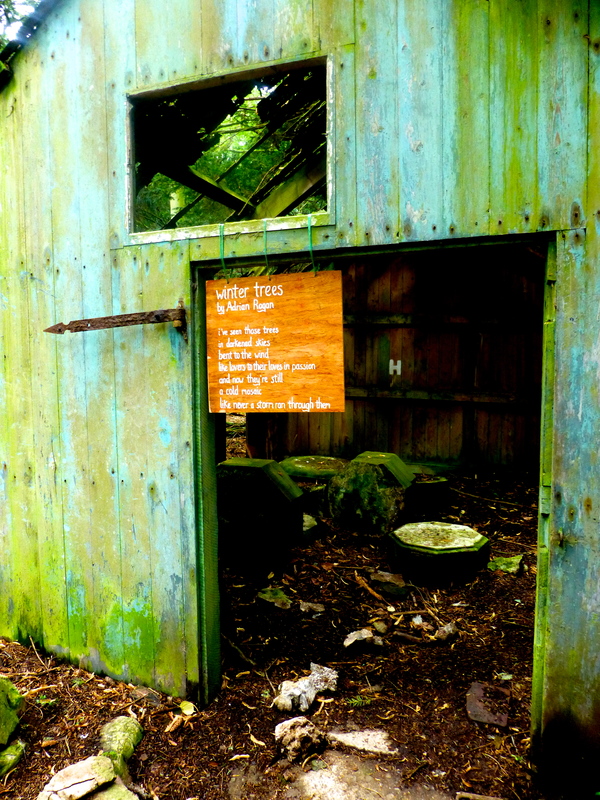 The first we saw of it was within a greening hut by a pond. 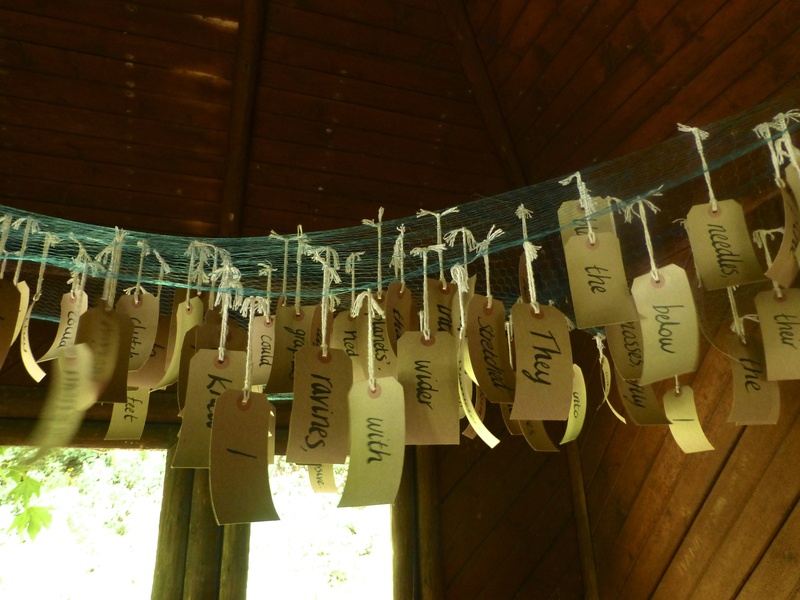 It was hanging from the ceiling, word by word, on both sides of the hut – luggage labels suspended from two green nets – like small brown fish. They spun around and moved in the breeze coming through the glassless windows. 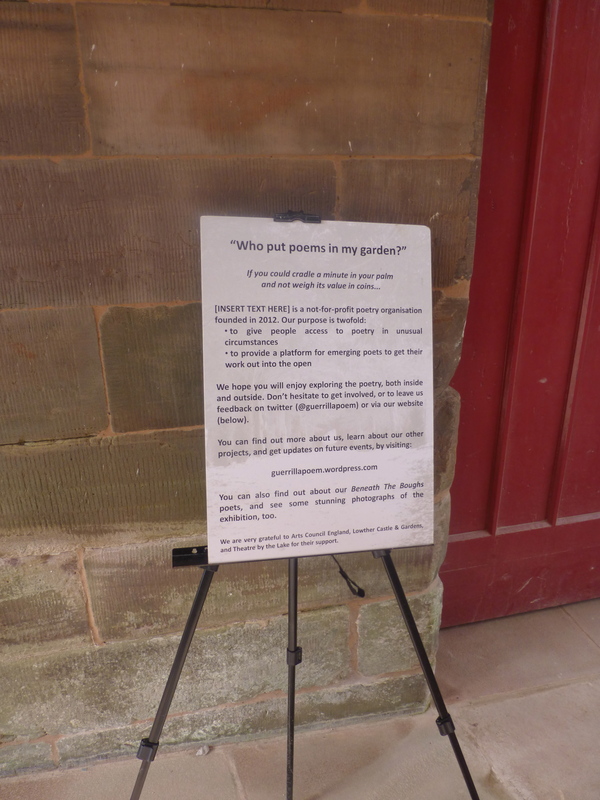 For those who might want to read the words in a specific order, the poem was also supplied on a board. Another poem was written in black ink on a mirror, placed opposite the open door. 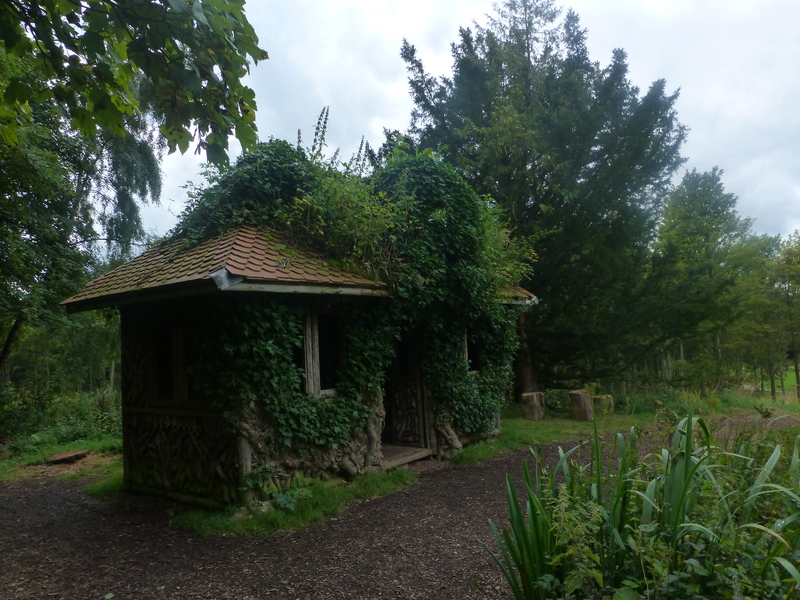 The pond, the hut itself, and the gardens beyond became part of the text, reflected in it and inseparable from it. 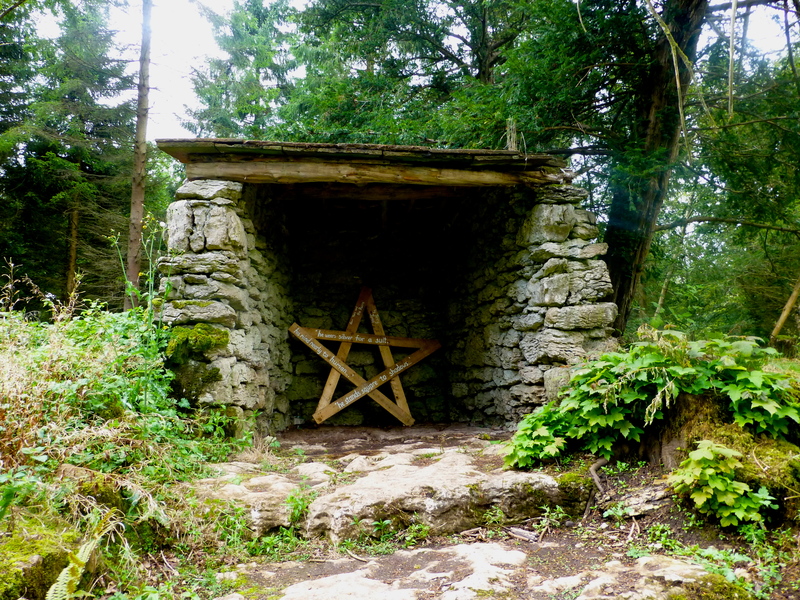 We wandered on, through woods, along wide grassy avenues, eating blackberries as we went, until we found more poems mushrooming in the shade of a pine grove. 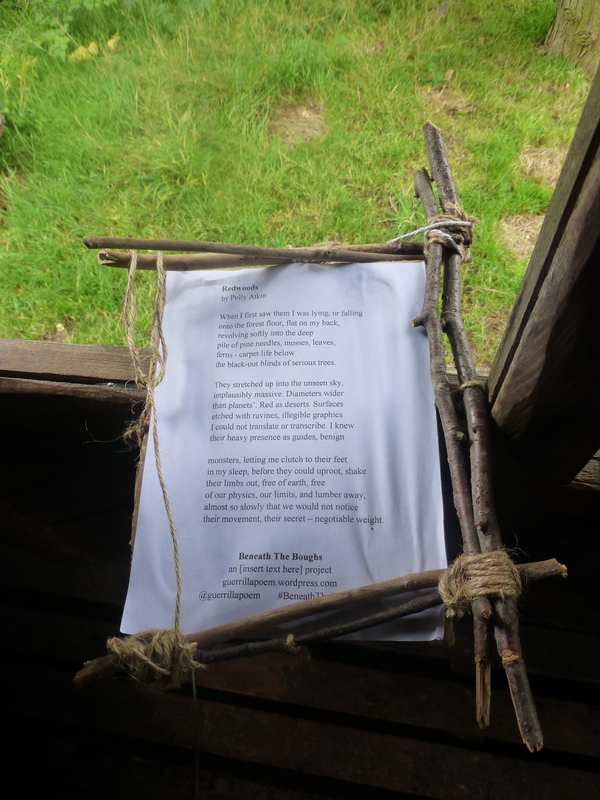 Everywhere we looked, clambering amongst the playground of trees and ruins, there were more poems. 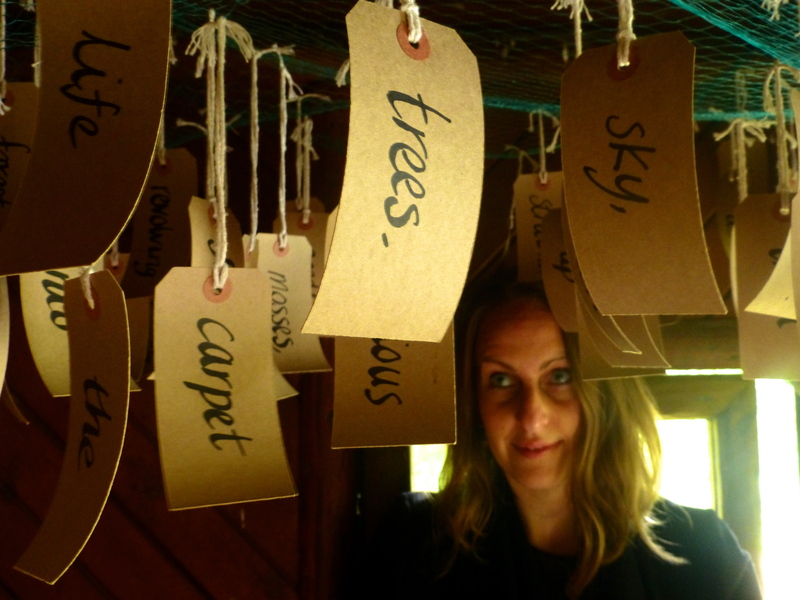 Poems spun on a clothesline; dangled from the branches of trees on small coloured boards like charms. 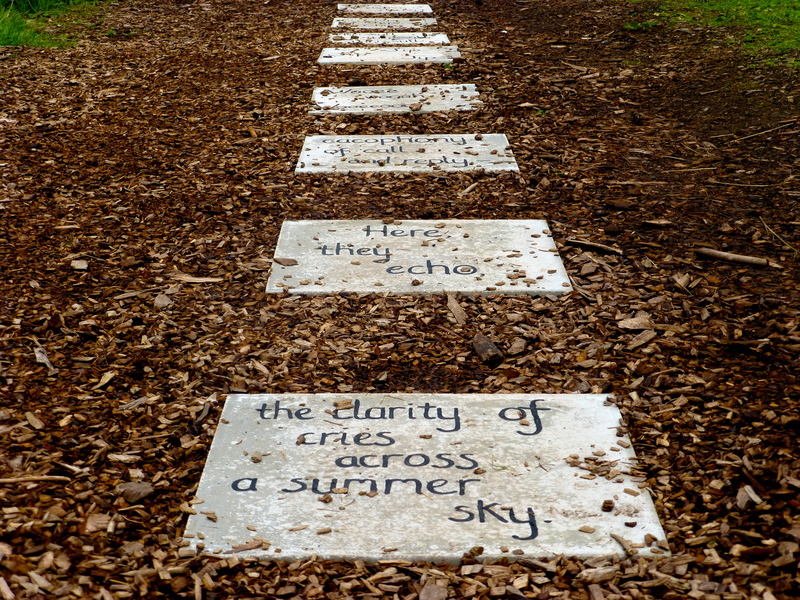 We walked over poems, set in the ground as paving stones; found them tucked into crevasses, shining quietly. 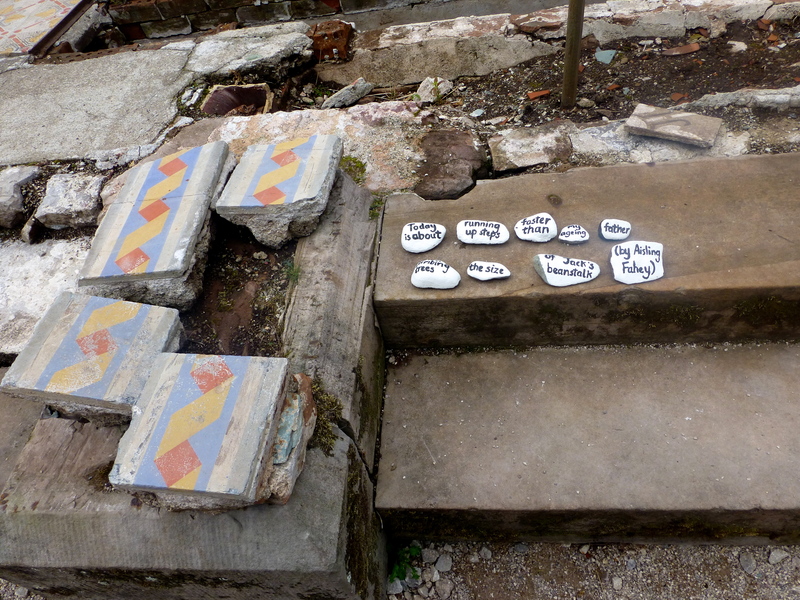 Back by the castle itself, we found poems on pebbles, laid out by the collected parts of a semi-shattered tiled floor. 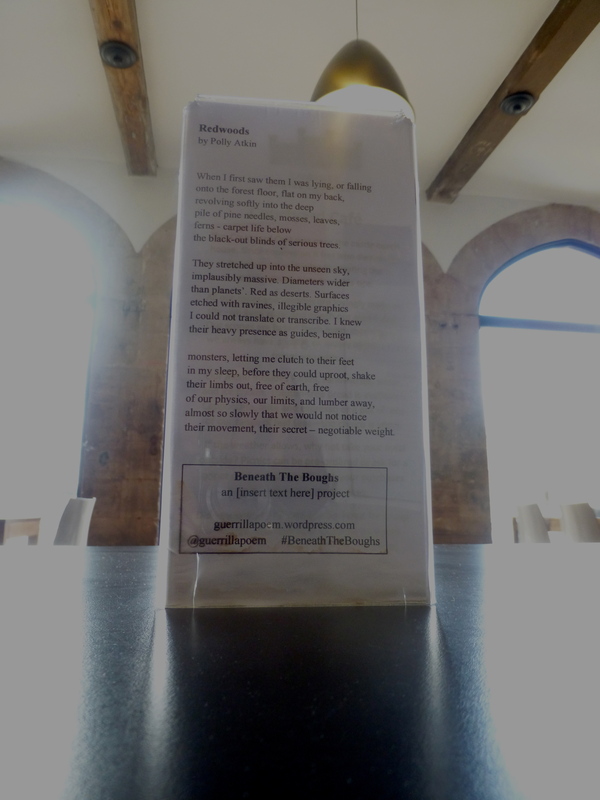 When we circled back round to the cafe by the entrance, we found that each table had a poem on the back of the menu. I went from table to table until I found mine. 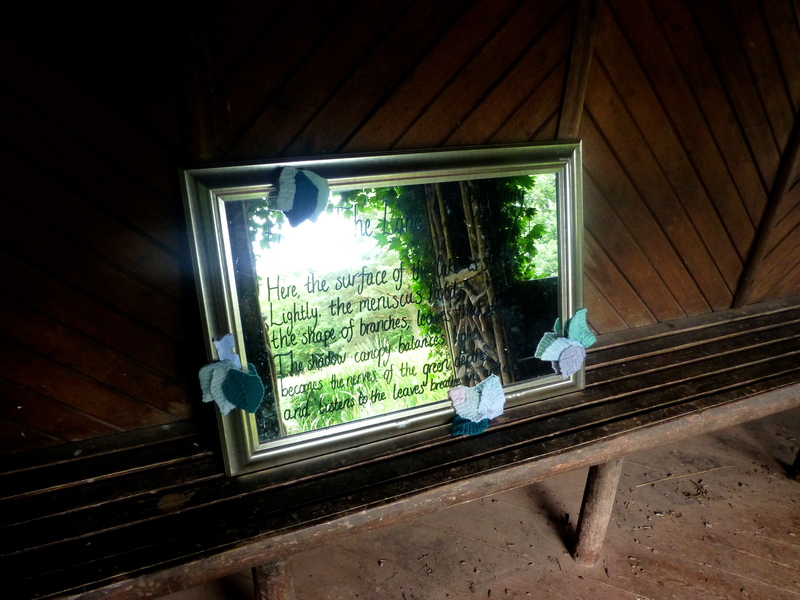 There were poems in the lavatories, poems tied to benches. I would’ve liked to have seen them stay, and multiply. To return and find poems twisting around the turrets with the creepers; etching themselves into the gravel of the wide main avenues. This is the poem itself. I interpreted ‘Beneath the Boughs’ very literally when deciding what to send in. the black-out blinds of serious trees. their movement, their secret – negotiable weight. 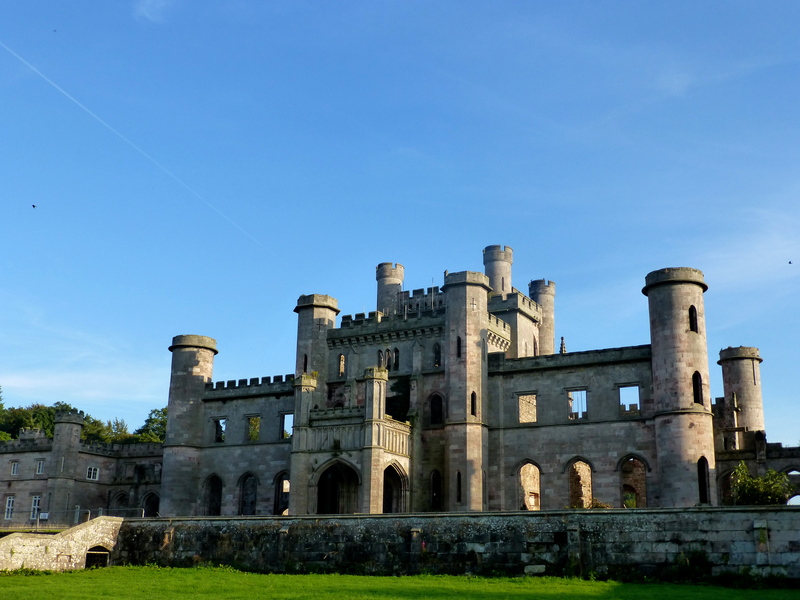 ‘Redwoods’ very kindly won me a season ticket to Lowther, so we’ve been back to experience the garden without the poems. There’s so much to explore in the semi-feral grounds anyone could spend days there, following the tracks that wind off through the trees to ornate steps that lead nowhere very much at all. Sunken gardens skulk alongside crumbling outhouses. The lime-stone escarpment has one of the best views in the area. 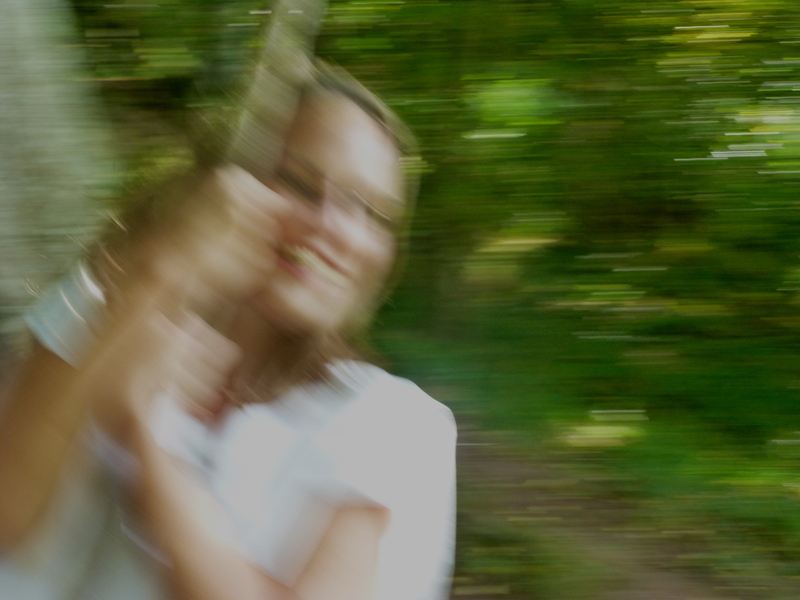 We were so preoccupied with stalking poems through the heronry on our first visit, we only found three of the six tree swings. 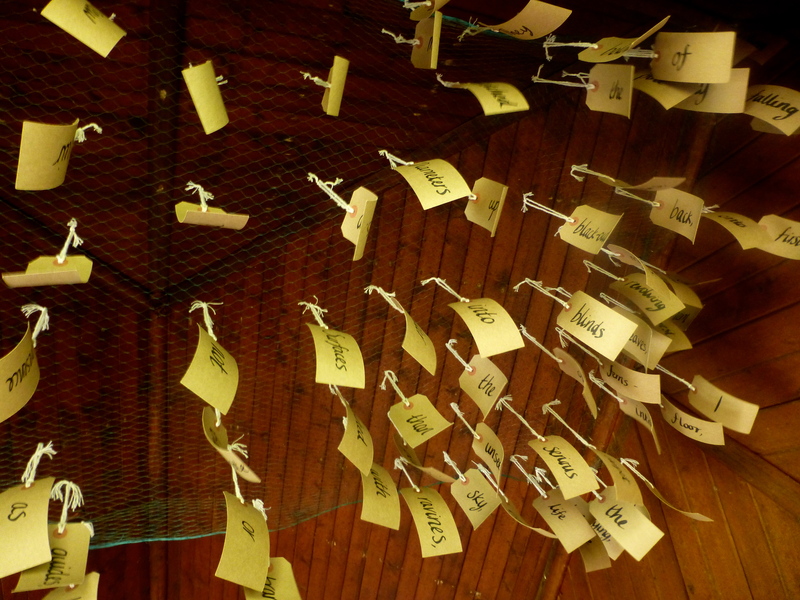 There was something quite wondrous about finding all these words in such unexpected places. 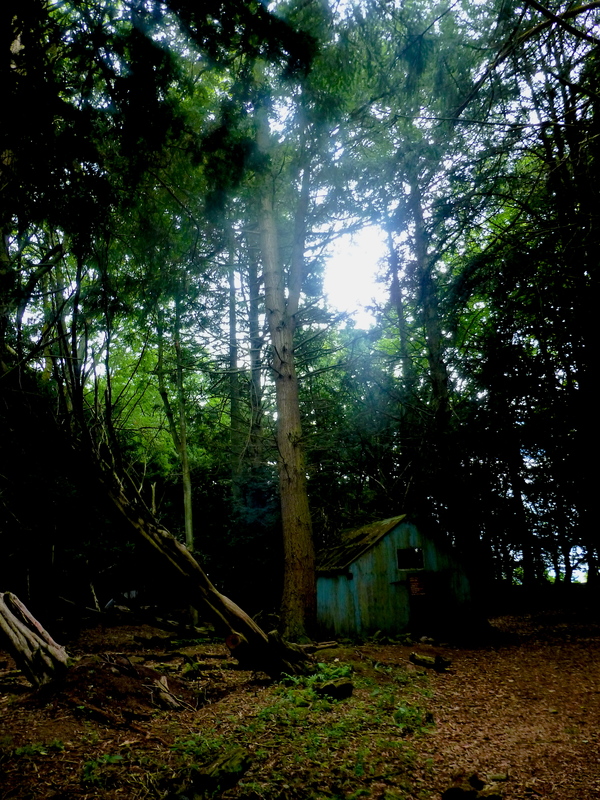 I’ll always think of the hut by the pond now as a little bit mine.